In today’s digital age, we are bombarded by advertising—so much so, we have become immune to it. This is why many of the clients I mentor often ask me about what type of advertising is the most effective. This is a fascinating question because there is no perfect answer. Rather, the best kind of advertising depends on a number of variables, including your company’s goals and your target audience. 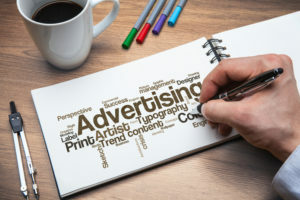 Here is a breakdown of the top types of advertising available to businesses. Currently, one of the great debates in advertising is about the power of television. For decades, TV had unrivaled reach and impact. But today, some experts question if TV is dead and if its power is waning. But according to a study by MarketShare, television’s power to attract an audience remains unrivaled. In fact, when it comes to key performing indicators, television is “the only medium to maintain its effectiveness (a 1.5 percent decrease in five years) while the other advertising media—both online and offline—declined more than 10 percent.” The study also found that despite disruption from on-demand services like Netflix and other new technologies, television ads still dominate sales. There is a lot of buzz about the death of newspapers and print media. But even though the newspaper industry is contracting and not reaping massive profit margins, it is still a powerful form of advertising. Print conveys a message of trust and credibility. People also respond to the fact that print ads are tangible. Moreover, since print is competing with other forms of advertising, its rates are more competitive. On the other hand, fewer people are reading print, so visibility isn’t what it used to be. Digital advertising is relatively new, but is fast-becoming a popular medium. This is why marketers have been furiously attempting to get ahead of the curve and tap into its massive potential. In 2015, Internet ad revenue reached $60 billion—an increase of 20 percent from 2014—and mobile ad revenue increased by more than 66 percent. There is no doubt that digital ads have the potential to reach a wide audience that will likely only continue to grow. Advertising is a powerful tool that can reap big dividends if used properly and done right. If you are considering advertising for your products or services, take time to assess which medium will be most effective for your needs. Contact me today if you would like help with your advertising strategy and want to stand out from your competitors.